Sean is [24 years old, $120,000 in debt and is part of the 60% of millennials who don’t hold any investments in the market. Sean’s first year out of college, he worked three part time jobs, freelanced on the side, and performed any chance he got to earn an income. He was fulfilling every millennial’s dream— except that he lived off of $15 a week for food, lost over 10 lbs. in a year because he couldn’t nourish is body, and almost completely blew his savings trying to stay on top of loan repayments starting at $945 per month. Now that he’s found steady employment and his savings are (for the most part) replenished, he wanted to deepen his knowledge of investing. Sean’s always been conservative when it comes to spending money. —His first job at 16 earning $7.25 an hour was at Pottery Barn. Sean managed to save large portions of his paychecks every week and funneled them into a savings account. 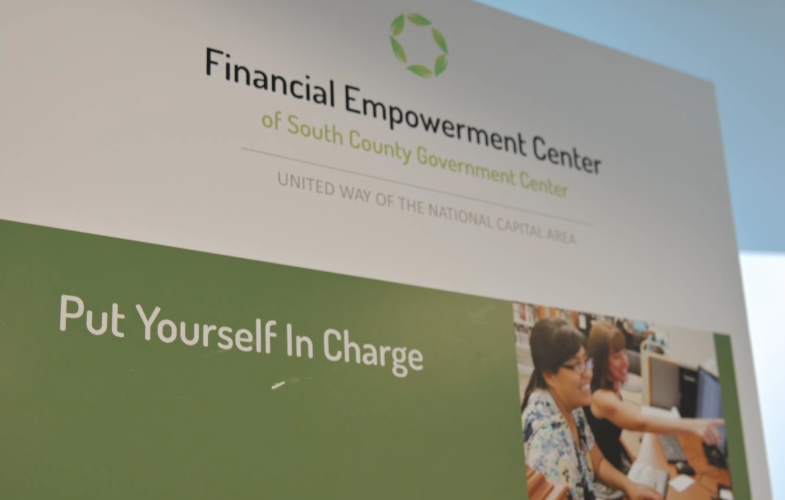 Sean learned that United Way NCA funded Financial Empowerment Centers, and knew they offered free financial coaching to anyone who made an appointment, regardless of their financial situation. Growing up, there wasn’t a place to talk about financial literacy. Public schools offered little in terms of resources to learn about investment or money management. Books and information salvageable from the internet were the most abundant, but without anyone to help walk him through the language, terms, rules and codes of the market, he didn’t feel confident in my knowledge. When he arrived at the FEC, Sean was greeted by Xanvier, the personal financial coach assigned to him. They started by looking at his total net income—how much money he earned from work versus expenses like student loan repayments, rent, food and transportation. Sean was used to adhering rather religiously to a budget, so he already had a notion of how much income he had month to month, how much to shift into an emergency savings account or invest in other assets. But the real revelations came when Sean and his financial coach began to talk about contributing to his 403b. He knew his employer matched his contributions up to 8% but he was hesitant to have that much money withdrawn every week on top of all other expenses. What if I lose my job and don’t have enough cash to avoid defaulting on loans? What if something happens and I’m not able to save enough in the event of an emergency? It’s under this rationale that Sean registered for the minimum, a modest 3%. When he revealed this to Xanvier, he nearly fell out of his seat. “When someone gives you free money, you don’t leave it on the table!” he said to Sean with a kind smirk. And with that he convinced Sean to maximize my company’s matching contributions. Next they looked at options to diversify the savings Sean accumulated strategically so that he wouldn’t put “all his eggs in one basket” so to speak. Xanvier described the respective pros and cons with working with a Credit Union versus a Bank, storing money in a savings account over locking it in a certificate of deposit, and how to plan investments while staying within a budget. The duo then discussed safer forms of investments like Money Markets, Mutual Funds, and private investments in addition to looking at the stock market. Most importantly, what Xanvier helped Sean realize was that his fear of defaulting on loans was keeping him from making smart choices with money that could actually help him pay off my loans faster. The money he was “saving” would either continue to go into an account and lose value over time or worse— inevitably get spent on materials he didn’t need. From ONE session at the Financial Empowerment Center Sean has so much more clarity on the options that are available for investing, saving and budgeting in the future. While his loan payments won’t be going anywhere anytime soon, Sean feels stronger knowing that there are steps he can take today that will help him be more financially stable in the future. The United Way NCA FEC at South County offers free financial workshops in first time home buying, budgeting, financial literacy as well as free tax preparation. To learn more about the United Way NCA Financial Empowerment Centers and opportunities available to give advocate or volunteer, please visit unitedwaynca.org.